It was in 1988 that Aruna Vasudev told me she was starting a magazine on Asian cinema, and that Latika Padgaonkar would also be working with her. She asked me to join. Have you thought of a name for the magazine? I asked. Yes, Cinemaya, she replied. We met for the first time in a little room in Aruna’s house. We began work on the first issue. Aruna had got together an impressive list of people from Asia and abroad as its Advisory Board and Correspondents. These included Tadao Sato, Donald Richie, Philip Cheah, Chris Berry, Peggy Chiao, Teddy Co, and Mehmet Basutcu, among many others. Once we got the issue ready, we spent a lot of time on the designing. One of Delhi’s eminent designers, Satish Sud, gave Cinemaya its distinctive first look by incorporating an Asian – particularly Japanese – notion of empty space in the placement of text and image. This design philosophy continued for a long time even under the new designers, Ashma Singh and Sunil Sud. The first issue was published with a grant from the Ministry of Information and Broadcasting, and was sponsored by the National Film Development Corporation in India. Our journey began and soon, we were on to the second issue. The cover story in the first issue was “New Voices in Japanese Cinema.” The second focused on Chinese cinema, featuring an excellent article on the Fifth Generation by the Chinese critic Ma Ning. That issue also carried what was probably the first-ever English article on Vietnamese cinema written by a Vietnamese. 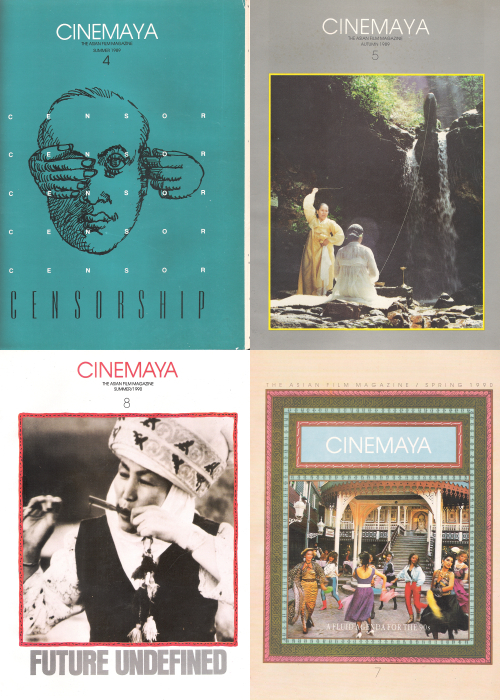 Cinemaya 2 was a collector’s item for another reason: a spotlight on the Japanese master, Sadao Yamanaka, who was little known outside his own country. The third issue focused on yet another unknown cinematic entity: Iranian cinema. Houshang Golmakani’s “No Trivia, No Masterpieces” contextualized the Iranian films that had just started winning awards at major international film festivals. Issue four was a special issue on “Censorship in Asian countries” that was funded by the Ministry of Culture in India. Another collector’s issue, it put together for the first time censorship rules and regulations – some stringent, some perplexing, others downright hilarious and paradoxical – in Asian countries. Soon, we were through with the first year of publication and received several encouraging write-ups in the press in India and abroad, including La Revue du Cinéma, Cahiers du Cinéma, Japan Times, Sight and Sound and Continuum. 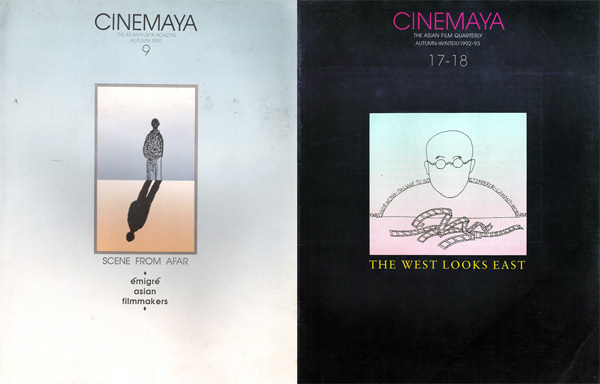 First three issues of Cinemaya. Aruna was very particular about the fact that we should aspire to be genuinely pan-Asian and never give in to making Cinemaya India-centric. That meant a lot of work, particularly in the early years, to ensure we had articles from Asia about Asia. We ensured that Cinemaya looked good. No compromises were ever made in the quality of paper, design and content. Cinemaya began at a historically opportune moment. There were festivals in the world that focused on the three continents of Asia, Africa and Latin America at Nantes and Tashkent. Yet, despite this focus, Asian cinema was never covered in all their wealth and glory. For decades, Asian cinema was only known for a few names that had won awards in European festivals: Akira Kurosawa and Satyajit Ray. The watershed year was 1989, when all three major awards at the Locarno Film Festival – where Aruna was a member of the international jury – were given to Asian films. The Golden Leopard went to Bae Yong-Kyun’s Why Has Bodhi Dharma Left for the East (South Korea); the Silver Leopard went to Shaji N. Karun’s The Birth (India); and the Bronze Leopard went to Kiarostami’s Where is My Friend’s Home? (Iran). Asian cinema was suddenly – News! The eighties also saw the rise of Asian film festivals. Many of these festivals thought in ‘pan-asian’ terms and focused on Asia in various ways, by having special sections or giving awards. Over the years, Cinemaya and NETPAC garnered the support of the International Forum for New Cinema in Berlin, the International Film Festivals of Amiens, Cannes, Fukuoka, Hawaii, Hong Kong, Istanbul, Pusan, Rotterdam, Vancouver and Yamagata. Cinemaya was listed in Film Literature Index, Media Review Digest, Magazine of the Movies and International Film Guide. Clockwise from top left: Issues 4, 5, 7 and 8. We conceived of several sections that persisted through the years: Country Profile, Director’s Column, On Screen (for reviews of new Asian films), Festival Reports, Spotlight (on Asian masters who were no more), Dossier (on filmmakers who were still working), Profiles (on actors) and Newsreel (with brief write-ups on recent happenings in Asian cinema). The editorial in Cinemaya also had a title: Frame by Frame. Every section was carefully planned. For instance, in the Spotlight section, there was usually an article that gave an overview of a filmmaker’s entire oeuvre, with a close analysis of one or two films. We carried filmographies of directors and actors, articles, interviews, short book reviews, notices of books and seminar reports on Asian cinema. The Newsreel section included news on national awards, film events and forthcoming festivals (with addresses and closing dates for entries). Our Country Profiles, which were usually our cover stories, gave historical overviews of each country’s cinema and contextualised present happenings. We came up with the title New Voice in Issue six. Aruna introduced a new section called Musings from Issue 34 onwards, which functioned as a carte blanche column where an eminent film person was allowed to ruminate on any aspect of cinema or his association with it. The section On Location was introduced somewhere along the way to cover films from Asia that were in production. Cinemaya was a measured mix of news and analysis. It provided a platform to discover Asian filmmakers, focus on contemporary masters, write about new trends of filmmaking, profile actors of Asian cinema, and interview filmmakers and cinematographers. It even provided space for directors to air their views. Even when we covered festivals from other continents, we focused on the Asian films shown at these festivals. After five years, we also printed an index of articles published in Cinemaya. The ninth issue, funded by the United Nations Educational, Scientific and Cultural Organization (UNESCO), was a collector’s issue on Émigré Asian Cinema that profiled Asian filmmakers who were working abroad. UNESCO, with the support of the Indian Council for Cultural Relations (ICCR) and the United Nations Development Programme (UNDP), also funded the First International Conference on Promoting Asian Cinema in 1990. Organised by Cinemaya, the five-day event brought together festival directors and Asian film experts, many of whom had been writing for Cinemaya. It also invited policy makers, providing the much-needed platform to share views and learn from each other. The idea for a Network for the Promotion of Asian Cinema (NETPAC) was born at this conference. As NETPAC became established, Cinemaya became its official journal. Today, NETPAC has 29 member countries. In addition, the NETPAC award for the Best Asian Film is presented at more than 28 festivals around the world. Even during the first year, we realised that the films that were being covered in Cinemaya must be seen. Cinemaya had to create an audience for Asian films that would transform itself into a readership for the magazine. In the second year of Cinemaya, we decided to present new Indian films. In addition to the presentation of new Indian films, Cinemaya began to organise film tributes from Asian countries. In 1993, the first week-long festival of South Korean films was organised. This was followed by a festival of Iranian films (in collaboration with ICCR) and a tribute to the Sri Lankan actress, Anoja Weerasinghe, in 1994. In 1995, there was a ten-day festival of fifteen Asian films from six countries on Buddhist themes. The festival was entitled “The Inner Path,” and travelled from Delhi to Calcutta. In 1996, there was a tribute to another Sri Lankan actress, Swarna Mallawarachchi. In 1997, there was another festival of South Korean films that travelled to five cities, and in 1998, a tribute to the Turkish filmmaker, Omer Kavur. To celebrate the Khajuraho Millenium in 1999, a festival of films on artists, entitled “Celebrating the Artist,” was organised. Lastly, a festival highlighting literary adaptations, entitled “Celebrating the Word and the Image,” was held in Delhi to close the millennium celebrations in 2000, . Cinemaya also began to programme films for Indian and foreign festivals. In 1992, Cinemaya programmed films for the Mumbai Documentary and Short Film Festival. In 1993, Cinemaya programmed the first-ever Asian Panorama section for the 8th International Film Festival for Children and Young People (ICYP) at Udaipur. In 1995, we programmed a section on Asian Women Directors called “Behind the Camera” for the International Film Festival of Indian (IFFI) in Mumbai. We also programmed the Asian Panorama for the 9th ICYP in Hyderabad once again, which has now become a competitive section. In 1996, a Special Tribute to Jahnu Barua was organised by Cinemaya for the International Film Festival at Brussels. 1997 saw the programming of the Asian Panorama at the Mumbai International Film Festival, the programming of Asian Perspectives for the Trivandrum International Film festival, and a section on Malayalam films at the Pesaro Film festival (in collaboration with NETPAC). In 1998, Asian Visions was presented at the Thessaloniki Film Festival as a NETPAC event. In 1999, Asian films were programmed for the International Film Festival at Cochin, along with a tribute to Adoor Gopalakrishnan at the Cinematheque Francaise in Paris. The tenth anniversary celebrations of Cinemaya in 1998 were a turning point for the quarterly. The celebrations included a special issue with a list of Top Ten Asian films of all time by connoisseurs of Asian cinema. The fiftieth issue of Cinemaya featured a list of Top Ten National Films. Cinemaya also organised a five-day event that included a festival of twelve films, a dance recital by the eminent classical dancer, Sonal Mansingh, and a music concert. In October 1998, Cinemaya helped organise a lecture on “The Portrayal of Japanese People in the Works of the Great Masters of Cinema (Akira Kurosawa, Shohei Imamura, Yasujiro Ozu)” by Tadao Sato. The response to all these events was overwhelming, and we realised that the time had come to set up an Asian Film Festival of our own. We approached the Delhi Government and, with sanctioned funds, organised the first Cinefan Film Festival in 1999. All of Cinemaya‘s activities to create an audience for Asian cinema were brought under the umbrella of the festival. Over the years, both the quarterly and the festival have carved a niche for themselves in the cultural life of New Delhi, Asia and the world. Although Cinemaya received grants from the government and other official agencies, core funding was hard to come by. Fatigue had begun to set in. In 2004, Cinemaya merged with Osian’s Connoisseurs of Art Pvt Ltd. With this amalgamation, the quarterly’s scope, look, and intent altered: there were more pages in full colour, and it featured a new design. While retaining its focus on the cinemas of Asia, it also expanded to include an integrated approach to the arts envisioned by Osian’s Chairman Neville Tuli. After a few sporadic issues, Cinemaya finally ceased publication. The tenth anniversary editorial stated that “Cinemaya has been back-breaking, heart-rending, exhilarating, but through the good times and bad it has been an adventure full of fun.” In the fiftieth issue, we were “Fighting Fit, Frolicking and Flying High.” What do we say now that Cinemaya has reached the end of its road? “A job well done!” Aruna had a single-minded vision had historical resonance. It was with the help of a small group of people (mostly women!) – who were as committed to her vision as she was – that she managed to make Cinemaya and Cinefan the institutions they turned out to be. The editor thanks Raman Chawla for providing the Cinemaya covers. Rashmi Doraiswamy is a Professor at the Academy of Third World Studies, Jamia Millia Islamia (New Delhi). Winner of the National Award for Best Critic (1995), she was the Executive Editor of Cinemaya and the co-editor of Being and Becoming: The Cinemas of Asia (Macmillan, 2002).